Rock the stone age look in this officially licensed Flintstone's Betty Rubble costume. Includes iconic blue dress and foam wig headpiece. Rubie's Costume Company has been bringing costumes and accessories to the world since 1950. As the world's leader, we take seriously the mission to make dressing up fun. Mascots, rental quality costumes, masks, wigs, accessories, shoes, and every significant licensed costume you want to wear can be found under the Rubie's brand. Still family owned and still family focused, Rubie's brings you fun for every season: Halloween, Christmas, Mardi Gras, Easter, and all in-between. Costume made of 100% polyester. Official licensed product of The Flintstones..
Secret Wishes features costumes for playful adults, for lots of different playful occasions. Secret Wishes sizing: XS 0 to 2, Small 4 to 6, Medium 8 to 10, and Large 10 to 12. Secret Wishes is a member of the Rubie's Family of Costumes, designing and manufacturing costumes and accessories since 1950. Based in Long Island, New York..
Rock the stone age look in this officially licensed Flintstone's Betty Rubble costume. Includes iconic blue dress, bone belt, and black wig. Rubie's Costume Company has been bringing costumes and accessories to the world since 1950. As the world's leader, we take seriously the mission to make dressing up fun. Mascots, rental quality costumes, masks, wigs, accessories, shoes, and every significant licensed costume you want to wear can be found under the Rubie's brand. Still family owned and still family focused, Rubie's brings you fun for every season: Halloween, Christmas, Mardi Gras, Easter, and all in-between. 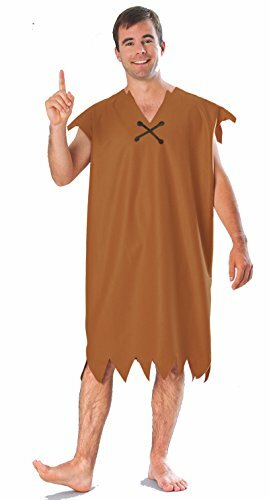 Barney Rubble Adult Costume Made From 100% Polyester Exclusive Of Trim.. 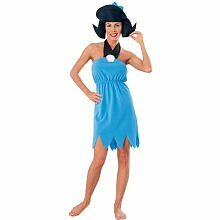 This Betty Rubble costume includes the blue dress and Betty wig topped with matching bow. The included black belt with white bones adds the finishing touch to this cute adult Betty Rubble costume. This Betty Rubble costume comes in adult sizes Small, Medium, Plus Size, X-Small. This Betty Rubble costume is an officially licensed The Flintstones costume. Please note: This item's color may vary due to inherent manufacturing variations or your computer monitor's color settings. The item you receive will be identical or substantially similar to the item pictured in this listing.. This Betty Rubble costume includes the blue dress and Betty wig topped with matching bow. The included black belt with white bones adds the finishing touch to this cute adult Betty Rubble costume. Our Betty Rubble costume comes in adult sizes Small, Medium, Plus Size, X-Small. This Betty Rubble costume is an officially licensed The Flintstones costume. Please note: This item's color may vary due to inherent manufacturing variations or your computer monitor's color settings. The item you receive will be identical or substantially similar to the item pictured in this listing.. The adult Fred Flintstone costume includes the orange and black tunic and and necktie. 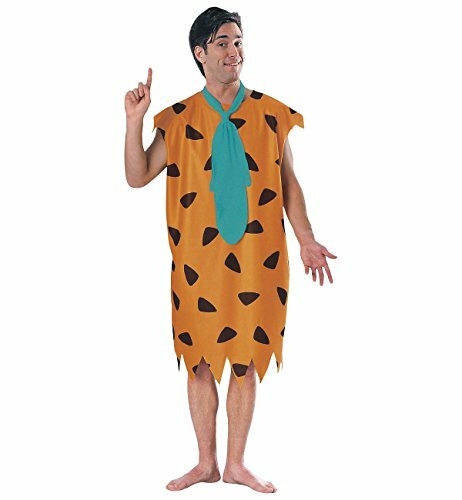 The adult Fred Flintstone costume comes in adult sizes X-Large, Standard. This adult Fred Flintstone costume is an officially licensed The Flintstones costume. Our Flintstones costumes make great group theme costumes for Halloween! Be sure to see our Wilma Flintstone costume for her, and don't forget Betty and Barney Rubble!. Rock the stone age look in this officially licensed Betty Rubble teen costume. Includes dress, belt, and wig. Rubie's Costume Company has been bringing costumes and accessories to the world since 1950. As the world's leader, we take seriously the mission to make dressing up fun. Mascots, rental quality costumes, masks, wigs, accessories, shoes, and every significant licensed costume you want to wear can be found under the Rubie's brand. Still family owned and still family focused, Rubie's brings you fun for every season: Halloween, Christmas, Mardi Gras, Easter, and all in-between. Want more The Flintstones Betty Rubble Adult Costumes similar ideas? Try to explore these searches: Gothic Halloween Decorations, Go Go Dancer Halloween Costumes Girls, and Easter Inflatables.